Are deer eating us out of house and home? David Lintern weighs the evidence in the latest battle for the heart of the beast. Red Deer may be Scottish icons, but they represent much more than a shortbread tin version of our beautiful country. They are at the heart of an ongoing struggle over land use and ownership, symbolic of our nature both wild and tamed, and are emblematic of the often-ambiguous relationship with the ground under our feet. And lest we forget in a sea of tourist (card)board cutouts and political metaphors, they are also real, physical animals… over which diverse social, economic and conservation interests battle furiously. You’re about to hear a whole lot more about deer… and not just from me. 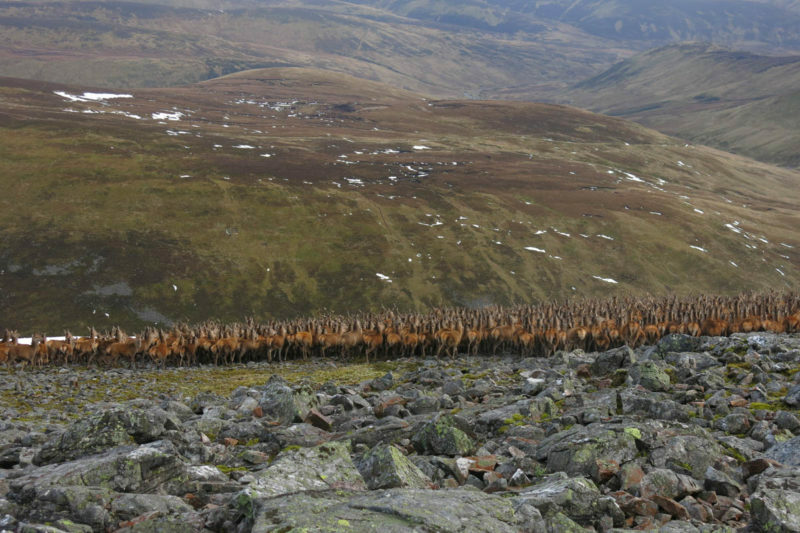 Following a big review of deer management practice produced by Scottish Natural Heritage (SNH) in December 2016, the Scottish parliament discussed it’s findings. A committee is due to make recommendations to the Cabinet Secretary for Environment, Climate Change and Land Reform – Roseanna Cunningham MSP – shortly. The report was the latest in a body of work stretching back over decades which has tried to grasp the nettle on deer overpopulation, which conservation organisations maintain is currently at epidemic proportions. This film, from a hill walk near Glenshee, was kindly shared by walker and climber Brian Shackleton. Brian’s experience was recently reported in the Press and Journal as a ‘breathtaking’ and ‘remarkable’ natural spectacle, but there is nothing natural about the presence of this many animals in one place. They may, as the article suggested, group together when storms approach, but the area is currently under a section 7 agreement, which means there is an acknowledged issue with deer overpopulation that SNH and local estates are trying to resolve. When I showed his video to friends and family, their reactions were telling: “Like rodents” one said. “Vermin with antlers.” said another. “That can’t be right” said a third. All understandable, instinctive reactions. I’d challenge even the most strident estate manager to tell us that this was a population at a volume that our countryside could support. But it’s not the deer’s fault. I’ve learnt more about the land from following deer tracks and stalking paths than I have from any other being – on two legs or four. They have kept vigil on many of my walks, especially when going quietly and solo into the hills on extended trips. I have escaped troubling terrain traps on their thin winding trails and marvelled at the sound of the rut on the hill. They are truly magnificent and majestic creatures. But we’re not looking after them properly. 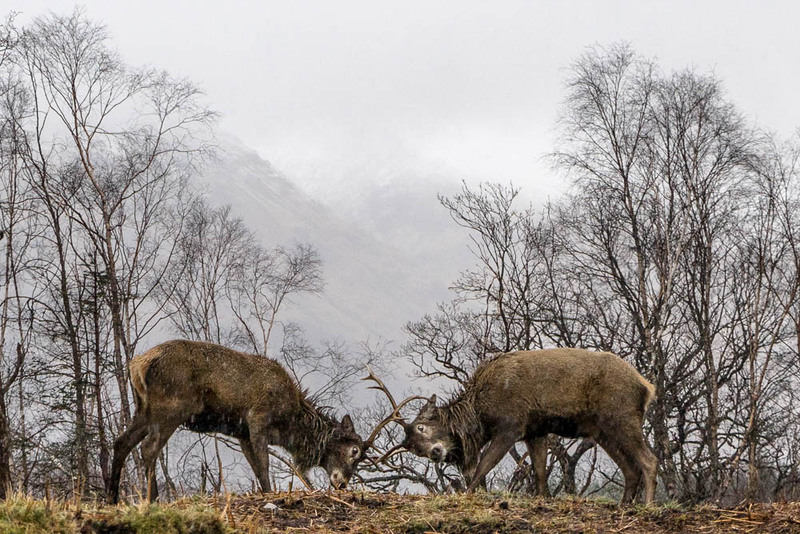 Between 1961 and 2016, red deer numbers in Scotland have increased by 60%. Without natural predation, there’s a tendency for numbers to keep rising until the limit to habitat or food is reached. The science seems to show we’ve reached peak red deer, but the jury is still out on lowland species like Roe, Sitka and Fallow. New numbers are currently being worked on, but the rough estimate at the moment is somewhere in excess of 700,000. This causes more damage to woodlands and agriculture, and increases traffic accidents and Lyme’s disease. The UK has some of the lowest native tree cover in Europe. Historical climate warming is no excuse – in Norway, at similar latitude and climatic conditions, trees still cover the hillsides. So why do we have so few trees? According to the Native Woodland Survey of Scotland (NWSS), about 33% of all native woodlands that do hang on are subject to ‘high’ or ‘very high’ levels of overgrazing. Even our more common trees, like birch and scots pine, can’t survive into maturity. Deer are the chief culprits. Perhaps a third doesn’t sound too much… until you consider that our native woodland is already an incredibly rare resource, covering only 6% of its original area in Scotland. Furthermore, woodland ecologists Holl and Armstrong point out that if one includes ‘medium’ levels of woodland damage, which reduces diversity by killing off the more vulnerable species like rowan, elm, ash, willow and the like, then the amount of native woodland being eaten to the ground jumps to an alarming 87%. Stripping bark on mature trees is one factor, but grazing saplings and new shoots means no new trees can mature to replace the old. Overgrazing destroys the understorey and leads directly to ‘geriatric’ woodlands – and correspondingly, in a loss of other woodland flora and fauna, particularly birds and insects. In short, without new trees, our woodlands are on borrowed time. As a response to all those hungry mouths, many landowners resort to fencing, often funded by the public purse through grant schemes, locking out deer from their native habitat and starving them of food and shelter. As a result Scottish deer are smaller than their European counterparts, and suffer from higher levels of starvation and exposure. Just take a long walk in the spring to see this in the flesh. Replacing the fencing currently nearing the end of its life is estimated at £100m. But this cost doesn’t include a growing need to mitigate the effects of climate change: encouraging natural flood prevention by regenerating and planting along rivers and burns (an estimated 25-50% of all waterways in Scotland!). I was shocked to learn that the Scottish government spends at least £4.8m a year on fencing alone, just at present levels. Can we afford yet more fences, or should we think about addressing the issue at source? For woodland regeneration to occur, a density of less than 5 deer per km2 is needed. Less than 1 per km2 and you really start to see major improvements – those waterways could heal themselves in a generation. By contrast, sporting estates tend to operate around 15+ per km2. In Caenlochan, near where Brian’s video was filmed, it’s more like 40. What about Europe? Average densities are around 0.1-0.4 per km2, and no need for deer fences. There’s no legal obligation for deer to be managed in a way that benefits them, other wildlife, habitat or even the economy. They are managed on a voluntary basis by the landowners, who have the right to shoot or fence them… or not, as they see fit. 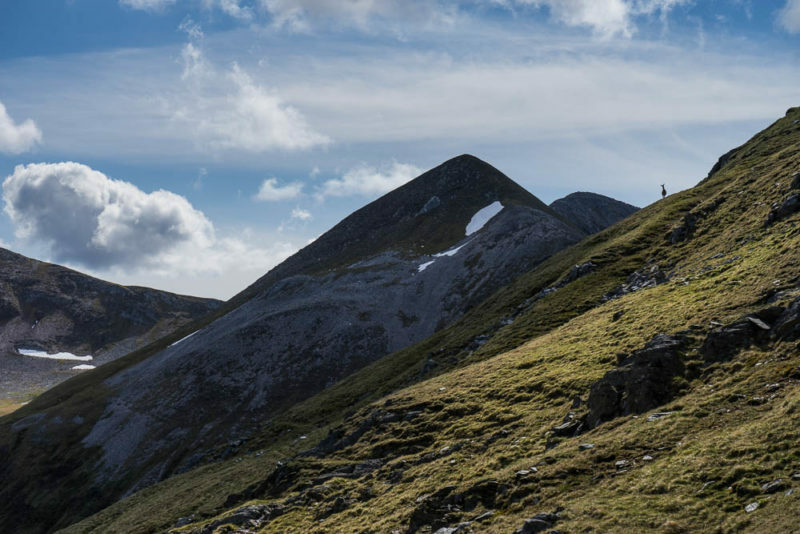 As we might expect, there’s a huge range of interests at play: Private estates – some operating for sport and some not, with varying degrees of efficiency – charities, crofters, agriculture and forestry businesses. Some sport shooting landowners maintain artificially high numbers on the hill by winter-feeding. Others manage for woodland, or grouse shooting, in which case they might exclude through fencing or keep numbers artificially low so as not to interfere with ground nesting birds. There are 44 upland Deer management groups (DMG’s) and 11 lowland groups in place, but they still cover less than 40% of the country as a whole. The remaining 61% of the country is not subject to any oversight at all, and as a result we know little about numbers and impact. We’re almost unique in Europe in having such a piecemeal approach to deer regulation. In practice, this leads to uneven management for private interests, rather than the good of the countryside as a whole. Critics describe DMG’s as ‘stag clubs’; worthwhile arenas for communication between members perhaps, but without the means of enforcing action internally. If SNH are concerned about damage to deer welfare, woodland, agriculture, natural heritage or public safety, they can attempt to invoke voluntary deer control agreements (under ‘section 7’ of the Deer Act 1996), but these are non-binding. It has never successfully enforced a compulsory control agreement (a ‘section 8’). What’s more, the SNH report shows that of all voluntary agreements, less than a quarter have been successful in meeting habitat targets, and only half have reduced deer numbers. Grazing impact is actually on the increase in another quarter of cases. On occasion, agreements have failed entirely because landowners refused to participate in talks at all. Results are patchy at best, but the SNH report isn’t all bad news. As the chair of the Association of Deer Management Groups, Richard Cooke, is keen to point out, some things have improved over the last 2 years. Following government grant support for Deer Management Plans, there are now more groups participating in planning with SNH, and more of these plans show positive results against public interest criteria like deer counts, habitat monitoring and transparency of information. But for conservationists there’s still a huge range of performance across the DMG’s: Less than half have identified actions to reduce impact on land at risk, and less than a quarter identify a sustainable level of grazing. So while engagement in the process has improved, but there’s still a lack of real action being taken. The war of words takes mysterious turns, too. Early in 2017, several news outlets ran a story claiming that deer weren’t the problem, but invasive species were. To those with a journalistic eye, it plainly had its origins in a press release rather than a researched piece… but at any rate, I wasn’t the only one to call foul on this red herring. The SNH report already acknowledges that invasives are the largest single threat to native woodland – but that doesn’t make deer overpopulation any less of a problem than it is. This was clearly meant to distract from the issue currently under discussion at Hollyrood. The SNH report is unequivocal about its conclusion: Deer Management Groups aren’t enacting (or even able to enact) changes in management that would reduce overgrazing. Something else is needed. What are deer worth in purely economic terms, aside from their value in social, cultural and habitat terms? Costs and benefits aren’t easily reduced in this way, of course, but a few numbers do stand out from the SNH report. Benefits: 722 jobs, a total worth of £15.8m per year to the private sector, and £1.8m to the public sector. Costs: privately £36.8m, publicly £12.9m. An additional £13.8m costs due to vehicle collision, on the increase yearly, and most of the £0.5m it takes to treat Lyme’s disease. By comparison, Mull’s reintroduction of white tailed eagles is reckoned to bring in £5million each year and generate 100 FTE jobs – just for that one species, and place alone. What about other research? An older study (Edwards and Kenyon 2013) quotes research done in 2006, which found a larger benefit of £105m income and 2520 FTE jobs. However, it’s worth noting that this included all associated tourism business, not just management related income… most of which would remain regardless of a higher cull rate. So, if we look purely at management, both public and private sectors make a net loss. Even the Scottish Gamekeepers Association admits that estates subsidise the deer business! The status quo is costing nature, and costing us. It needs to change. It’s a sad but unavoidable truth that the question of land use, and for whose benefit, is bound up with a historical sense of injustice, and a growing call for land reform. There have been waves of clearances; people, trees and wildlife. And because deer have no natural predators in the UK, it’s also understandable that the conservation-minded should call for the return of apex predators like lynx and wolves. But politics is the art of the possible, and we’ll need carrots as well as sticks to make this work. 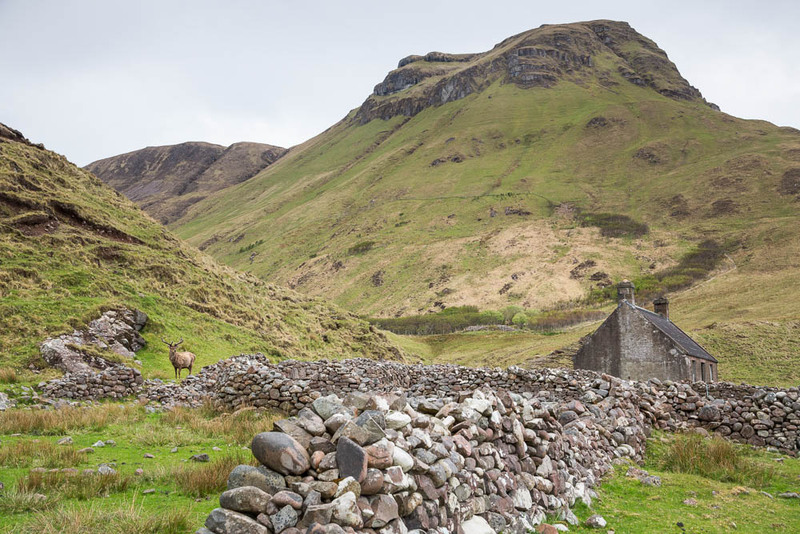 Alongside better information and regulation, there should also be support for estates, crofters and the general public, as well as for the animals themselves – financial incentives, grants and subsidies, education and re-training – for progress to be made. In the coming years, alongside building a passionate but scientific case for big predators, I think we’ll need to help estate managers square the circle to meet both their commercial stalking and public interest duties. 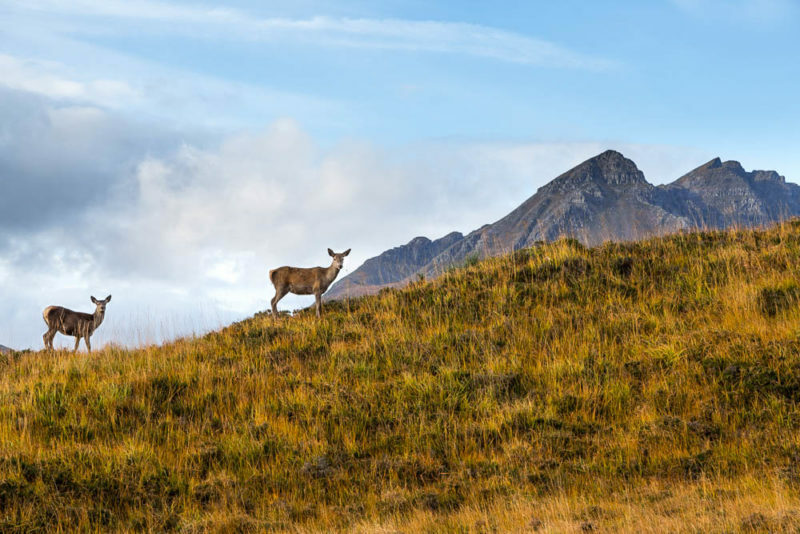 Scotland’s Red Deer research project, based on Rum, has demonstrated clear advantages for estates in reducing deer numbers. In the north of the island, a lack of culling led directly to significantly more hinds and less stags… by a factor of 3. It’s worth watching the video above again with this gender imbalance in mind. Moreover, the stags that did make it to adulthood were more likely to ‘emigrate’ to another area and be in poorer condition, with smaller antlers. Reducing deer density by the amount suggested on Rum (already deforested) still isn’t low enough to help native woodlands in most cases, but it would help in some, say experts with the Native Woodland Survey. Sport estates are valued by the number of stags shot – not their condition – but the Rum research shows that the financial performance of many sport estates can be improved. With the support of forward thinking trade and tourist organisations, there’s no reason why some shouldn’t market ‘ethical’ stalking on rewilded ground, with a genuine sense of quarry… for a more ‘discerning’ and wealthy client who wants to hunt big game in the UK. It’s not to everyone’s taste – and no, it’s not my cup of tea either – but with a little imagination at the premium end of the market, less really could be more. And at the other end of the spectrum, culling more deer could open up stalking (both professional and for sport) and venison production to the wider population, reconnecting more of us with this iconic animal as livelihood, game and food for the table. A higher cull rate could both increase profits and democratise those benefits at a local level, where it counts – more employment, and more visitors. Lastly, there would be new wildlife tourism opportunities – like on Mull with it’s White Tailed Eagles – and new woodlands to plant and care for. This too could bring life back to the glens, for people and nature. But none of this is possible without government support. The RSPB, Ramblers Scotland, Scottish Wildlife Trust, Trees for Life, The Woodland Trust and the John Muir Trust are all firmly of the belief that change is needed, but are conciliatory about next steps. They have requested that sustainable management of deer should be a legal requirement for landowners. They’d like to see planned cull figures checked with SNH on a yearly basis to meet the environmental, social and economic objectives not of private interests but of the country at large, and they want SNH to be able to step if needed to see these cull rates are achieved. Lastly, they want to see more data collected on the non-red species, and that other 60% of the country currently without any oversight at all, so we can better track habitat and biodiversity loss and act to repair it in time. These measures aim “to encourage the voluntary approach to work more effectively and enable adequate culls to be carried out when it does not”. 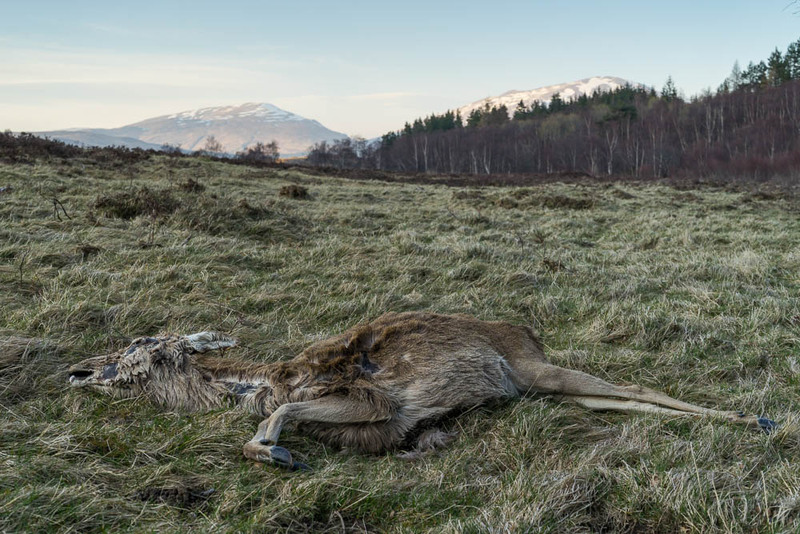 Existing methods of managing deer are not working – the data (as well as that shocking video) proves it – but without statutory powers, SNH can’t act to improve matters for wildlife, nature and the people of Scotland. It’s our natural heritage, after all.